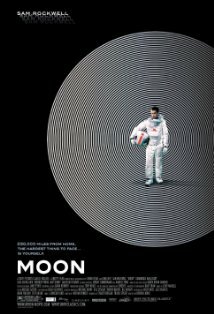 Last night, I finally got a chance to watch Hugo award winning Moon by Duncan Jones, son of the acclaimed musician, David Bowie. David Bowie’s music certainly had its science fiction influence, especially his Ziggy Stardust album, so I guess it’s no surprise that his son’s first major film would be a science fiction endeavor. I had heard great things about the film and had been meaning to watch it for awhile. Recently, Moon won a Hugo award for Best Dramatic Presentation, Long Form and it also became available for instant watch on Netflix so I really had no more excuses. I was rewarded with a very intelligent film about an astronaut at the end of his three-year stint working on the moon. The film is a very solitary view of Sam’s final days on the moon and addresses many of the atrocities that could occur in such a situation. I don’t want to go into more detail for fear of spoiling essential plot points, but, needless to say, the most interesting aspects of the film are the horrors that Sam uncovers. The film has a minimal, but high quality cast with Sam Bell being played by Sam Rockwell and the computer GERTY being voiced by Kevin Spacey, whose monotone dialog was delivered perfectly. Overall, I thought the film was well done, especially for an independent production, and the plot was very good. It’s not a film that will keep you on the edge of your seat; the story is a more subtle and intellectual than it is action-packed. Still, there was enough suspense and intrigue that I never got bored. I’m definitely glad that I watched it, but it won’t go down as one of my favorites.